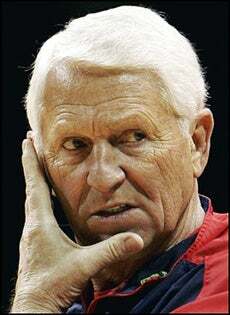 Legendary Arizona Wildcats coach Lute Olson surprised everyone with yesterday's announcement that he's leaving the team for an undisclosed amount of time, effective immediately. "I've given 110 percent to this team and this job," Olson said through his wife Christine's press personnel. "In light of this personal matter, I feel it is in the best interest of the team and the University of Arizona to take a leave of absence." At a news conference Sunday, Arizona Athletic Director Jim Livengood confirmed it was not a health-related issue, repeating that it was a personal issue. Olson has asked for his family's privacy, and Livengood and O'Neill have asked the media to respect those wishes. It's pretty obvious that it would take something of great significance to pull Coach Olson away from his team, especially with the season getting underway. The last time the Hall of Famer missed significant time was back in 2001, when Olson lost his wife Bobbi to cancer. Newly imported assistant coach Kevin O'Neil will take over the program until Olson can return. O'Neil is best known as the former head coach of the Toronto Raptors (they're like an NBA team only they play in Canada) and an assistant with the Pacers and Knicks. The suspected Canadian was brought in to be the heir apparent to Olson's kingdom, but now he's going to have to pick things up as he goes. The roster is stacked with talent and assistant coach Josh Pastner has an intimate familiarity with all things Arizona basketball. It's also worth noting that Olson's grandson, and former walk-on, Matt Brase is a member of the coaching staff.